Critically and crucially, IBS sufferers understand that ice-cream is just a complete write off. If it’s not the high quantities of lactose (check! ), it’s the hugely dense fat and calorie count (double check! Testament to this is how the USDA considers 2 tablespoons of ice-cream to be the entire fat and sugar limit for the average adult), the abnormal amounts of white sugar crystals which, after a strenuous workout in the digestive tract, leaves acetic acid, water and carbon dioxide (which is why you’re probably left feeling incredibly bloated after a high-sugar meal)… as well as the fact that once you start a tub, you just can’t stop! But ice-cream is damned delicious. It’s like the food god’s are offering you a free pass to Heaven every time you take a big ole’ mouthful…. And tummy hell once it’s fully digested (or lack thereof). 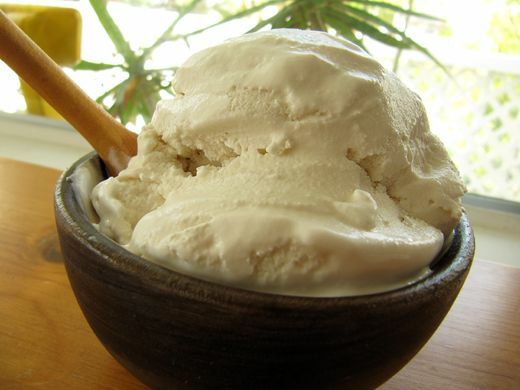 That’s why all I eat now is my homemade banana ice-cream, made not from cream or any dairy, but just pure banana puree. It’s easy to see why there are so many amazing banana ice-cream recipes online and they fit in perfectly with an IBS, Paleo and low FODMAP way of life. I, however, make mine a little more irresistible by adding in raw organic almond butter made with 100% almonds and a little sea salt (Biona is a good brand for this) and some finely roasted almonds on top. Firstly freeze the bananas. You do this by peeling the ripe bananas, cutting them up and popping them in the freezer on a baking sheet. These should only take around 2 hours to freeze totally. Once fully frozen, blitz the bananas in a blender and keep doing so until they’re creamy and smooth. A little milk can be added if your blender isn’t tough enough. Add the nut butter and keep pureeing. Serve immediately. Be aware that this will be nice and creamy and more like Gelato. If you’d prefer a harder, more solid ice-cream you can scoop, pop it in the freezer for a few hours after blending. Toast your chopped almonds in a pan until browned. This shouldn’t take longer than a few minutes. Are Low-Fat and Fat-Free Yogurts Healthy? What’s the Difference Between Crêpes and Pancakes? Which Fish has the Highest Omega 3? What is A2 Milk and Is It Healthier Than Regular Milk? The Difference Between Cooking Oils | Which Should I Cook With?